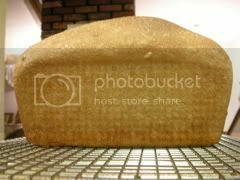 Bread Baking Problems and Solutions - Here are pictures of bread baked by me in our 8" bread pans. It makes excellent sandwiches that hold together. I used Marilyn's Famous Whole Wheat Bread Recipe. Q. 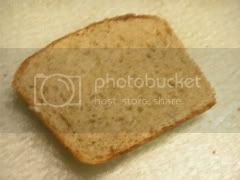 How do I get my bread to be suitable for making sandwiches? A. There are three basic principles for making bread good enough for sandwiches. 1. Add 1/3 to ½ cup vital wheat gluten to a 2 loaf batch of bread. Make sure the gluten is fully developed. Vital gluten makes the bread softer, moister and it rises better. 2. Make sure you don't add too much flour – this leads to dry, crumbly bread when it cools. The dough should be smooth and elastic and a tiny bit tacky, not dry when shaping your loaves. 3.Don't over rise the bread – coarse texture leads to crumbly bread. Q. Is it really cheaper to make homemade bread? A. Cost isn't the only factor to consider when determining if bread baking is a good thing for your family. Consider the wonderful aroma in your home from home baking, and the superior nutritional value. I am glad that my homemade bread contains ingredients that I recogzine and I know how to pronounce them. Home baked bread has superior taste, and the fact that home made bread is very easy to incorporate into my routine is an added bonus. It is an added benefit to bless friends and neighbors with home baked bread. Q. What is sponging and is it necessary? A. Sponging is the process of allowing the yeast, water and a portion of the flour to be mixed together for about 15 minutes to activate the yeast. You could consider sponging a short, first rising. All yeast bread baking is flexible, however, and you can skip sponging and allow the bread to rise once or twice before baking. Be sure to get all the air bubbles out of the dough before shaping the loaves. 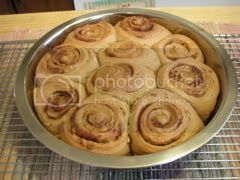 Bread can rise just once in the pans before baking if you are running out of time. Conversely, bread can rise multiple times before shaping, rising, and the baking. Each rising period will improve flavor and texture. Be flexible and allow baking to fit around your schedule. Q. I have some yeast bread recipes that do not call for fresh milled flour. How do I adjust the recipe? A. I substitute cup for cup, whole grain hard wheat flour for all purpose flour in yeast bread recipes that appeal to me. The only adjustment I make is adding some vital gluten so the bread will not be too dense or heavy or dry. Q. Can I use my fresh ground flour for cookies, pancakes and muffins? A. Use freshly milled soft wheat flour or pastry wheat for any baked goods that do not contain yeast. Remember freshly milled pastry flour must be packed like brown sugar for accurate measurements. You can obtain more information about ingredients and how to use them. Q. My bread doesn’t rise very well. A. Whole grain bread will not rise as well as white bread, but if you have waited several hours and the bread hasn’t doubled in size, the problem most likely is the use of low protein wheat. Low protein means low gluten content. All wheat is not created equal, and premium wheat will have a higher protein content than less expensive wheat. Use 1 Tbsp. vital gluten per cup of flour as a starting place. Q. I have some older yeast and I don't know if it is still good. What do I do? Add 1 tsp. yeast, with 1/2 cup warm water (85°F) and 1 tsp. sugar. If the yeast isn’t bubbling up to the top of the cup within 10 minutes, replace the yeast. Be sure to store yeast cool and dry. Use moisture/vapor proof containers.